Andre Villas-Boas has complained to referees' chief Mike Riley about the performance of the officials in Chelsea's defeat on Sunday. 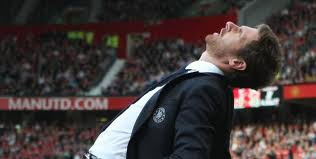 The manager is still smarting by the manner of what was his first loss in charge of the Blues, who fell 2-0 behind at Old Trafford to goals which replays showed should not have stood as both scorers had been offside, with United eventually running out 3-1 winners. He said: "Very, very unhappy with a poor performance from the referees, which in the end had a decisive role in the result, and I don't take it very, very lightly. You expect the linesman to do his job. I already went further ahead with the situation by speaking to the correct people. We all feel very, very down when the referee had such an impact on the result."